Interview with Don Campbell – Mentions KINDERMUSIK! Posted by Kindermusik with Amanda in Child Development, Early Childhood Education, Kindermusik, Learning, Music Makes a Difference! WebMD Live Events Transcript Event Date: 09/11/2000. “Moderator: Hello and Welcome to the Parenting Today Program on WebMD LIVE. Mr. Campbell, it’s a pleasure having you here today. Before we begin taking questions, would you tell everyone a little bit about your background and area of expertise? Campbell: I am a classical musician, teacher, and journalist. Having written seven books on music, health, and education, I have been guest faculty for seven years teaching psychology and music at Naropa University, and have been key noter and guest lecturer at over 500 musical, medical and educational institutions. Moderator: Why do you think music is of special importance in early childhood development? Campbell: Music stimulates the brain, the emotions, and the body simultaneously. Auditory impulses structure the way we learn to communicate. In speech, movement, and expression, music holds many nutrients for the developing mind of children. It is my work to inform and inspire parents, healthcare providers, and early childhood educators on these great benefits. Moderator: Tell us about the origins of “The Mozart Effect.” When and how did Mozart’s music begin to be used for health an educational purposes? Campbell: In 1957, Dr. Alfred Tomatis, a French ear, nose and throat specialist who began experimenting with children with music with speech and communication disorders. By 1965, he had invented a device called the electronic ear, which took out most of the low frequencies of music, and would send high frequency messages through the right ear, to the left brain for re-patterning the perception of auditory stimulation. By 1980, there were 200 centers worldwide working with autistic, dyslexic, and head injured children and adults. He discovered that Mozart’s music was the best organized for orderly time/space/spatial perception. 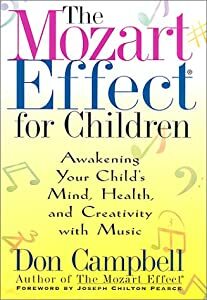 In the 1990’s, new research suggested that some of Mozart’s music may be beneficial for developing spatial intelligence. Moderator: Is Mozart the only classical composer you recommend? Is there a place for using popular and folk music with our children as well? Campbell: There is a place for all music in our lives, as long as it is not too loud and injures the cochlea. Classical music is well ordered, and Mozart represents that in the music he wrote as a child and young adult. Romantic music, such as Beethoven and Brahms have far more emotional and heroic energies. It is important to remember that no music is an instant cure-all. But the making and listening to music at appropriate times can be quite miraculous. When there is stress or pain, music, and music making can help release the stress of pain. It is most useful at naptime, bedtime, and creative play time. To a young child, the music is movement. It is participating and flowing with the activity and stimulation, or the deep relaxation. Every parent can be aware of the environment, the sound environment, for their child. If there are TV’s, computers, radios, and even refrigerators heard in a child’s room, it can highly disrupt their sleep pattern. Especially if a child is ill. The ear easily receives auditory stimulation in the last trimester before birth. Many children are hypersensitive to sound, and find each and every sound distracting. Thus, they are often unable to focus on one activity at a time. This is common with children with attention deficit disorder and dyslexia. tenuli_webmd: I understand that studying music has a positive effect on a child’s math abilities. Can you explain the connection? Campbell: Math is a very broad term. The earlier a child studies music, the more rhythmic integration, movement, and learning about proportions in time space perception, strengthens the young brain. In over 1,000 American communities, early childhood music programs, such as music together, musicgarten, and kindermusik, provide parents and children with exceptional programs for developing mind and body integration. In the elementary years, playing an instrument and reading music assists in the overall development of the speech and movement, as well as language and math perception. Music is magical because it reaches multiple levels of neurostimulation simultaneously. However, I know of no studies that deal with calculus, trigonometry, and Mozart, other than anecdotal reports from college students who find Mozart’s music beneficial during study. candymay_webmd: At what age is it good to get your children into taking up a musical instrument? And is one better than another? Campbell: The earlier the better for musical participation. Yet never force an instrument on a child. Suzuki violin is a wonderful way to train the ear, hand, and heart coordination. Rhythm instruments are good in preschool years, as well as a lot of singing. It is important for children to have some musical experience while in elementary school with instruments, while the brain can so easily form memory and movement patterns. Every child will be a little different. candymay_webmd: Earlier you said having the child’s surroundings quiet is good, but I’ve heard it’s a good idea that you should get your child used to noises around the house, so that they sleep and don’t wake up at every little noise? Campbell: The ear, mind and body are extremely adaptable. My concern has been that we are creating an over stimulating atmosphere for our children. When there is too much stimulation, year after year, we often find a teen or young adult who is unable to sit still, deeply relax, and find a deep comfort in quiet. Later on this can bring on high blood pressure, strokes and heart conditions. I believe our schools and communities are loud enough, and want to be sure children know quiet as a part of their life, before tension overwhelms them. Moderator: Do you really think music can make you more intelligent? If so, how? Campbell: Yes. The rhythmic quality of music stimulates and activates the lower part of the brain stem systems. The harmonies of music, and the rhythm of these harmonies at times has an emotional response within the body. The melody, and tone color bring direct responses as well as text and language in music from the neo-cortex. Intelligence in the new millennium, I believe, will be judged on the children and families who are able to integrate knowledge and information with a healthy relaxed body, and be able to socially integrate it emotionally. Music prepares the brain and body for connection. And we are at the beginning of learning how to ask integrated questions about memory and intelligence. I know from my experience with the Guggenheim education project in Chicago, we were able to improve spelling almost immediately by using music and movement. Not as a gimmick, but as an integrated tool for the mind, voice, and the body to learn simultaneously. I speak of this clearly in my new book. Moderator: Why are so many schools across the country cutting their music programs if music is so vital to a child’s development, self confidence and intelligence? Campbell: For the past many decades music has been referred to as only art, entertainment, and a thrill. Only in the last 15 years have we begun to see how organized auditory stimulation in the form of music has great inroads for developing neuro-connections for multiple purposes, such as linguistic vestibular, and kinesthetic integration. sggoff_webmd: How much time in a week do you recommend a child should be involved with music? Campbell: It depends on the child’s age. Remember, all speech has musical qualities. The younger the child, the more chant, tap, and play. In preschool, I think there’s a place for a song every hour or two, or a nursery rhyme with movement. It’s not just music time, but remember, music is time. In early elementary school, the majority of games have musical qualities or elements within them. So I would like to see a little music for waking in the morning, music in the car, music at bedtime, as well as a 20- or 30-minute music class. But remember, this music is not for the child alone, it helps reduce stress and inspires moms and dads. Moderator: Can you suggest three to four easy ways in which music can be integrated into the modern family to maintain wellness, motivation and inspiration? Campbell: Yes. Wake up to good music in the morning. Bright, fresh, even a little Eine Kleine Nacht musik (“a little night music” is the translation) for waking up at breakfast is wonderful. Musical time for creativity, drawing and naptime. I have an album called “Relax, Daydream and Draw.” Perfect for that afternoon slow-down time. Music in the car, and then one special album that the parent and child choose together for three or four months at a time, this album is the nighttime album. It’s played when the lights go down, when we put our pajamas on; it’s low in the background with nighttime stories. That music is an indication that it’s time to sleep. I have an album called “nighty-night” for babies. Modify with the environment, what the child likes, and select from your own CDs. In more daytime practicality, something that’s very helpful to a young child learning to read is reading to them with a slow constant beat in the background. Tapping in the background helps a child find a place for words. Moderator: We are almost out of time. Before we say goodbye, is there anything you would like to add on the subject? A native of Philadelphia, PA, Amanda has a great love for all forms of artistic expression. The daughter of a music teacher and a director of children's education, she has always been surrounded by music and children, and has been drawing, singing, ringing, dancing and performing ever since she can remember. She attended Cornell University, studying Fine Art and Psychology, and has continued to study developmental psychology with a particular interest in learning styles and differences/disabilities. She is currently in her 8th season ringing with the Philadelphia Handbell Ensemble (http://www.phillybells.org/), members of the prestigious organization, PennPAT (Pennsylvania Performing Artists on Tour). After working at a software engineering company for several years (in marketing and customer relations), the birth of her daughter gave Amanda the opportunity to re-evaluate her priorities, and she decided to return to more artistic endeavors. Currently a stay-at-home mom and freelance graphic artist, she couldn't be more excited about becoming a licensed Kindermusik Educator. She is excited to share her passion for learning and music with the next generation. How Will You Celebrate National Screen-Free Week? Come Try a FREE Preview Class!